Lockdowns have become the go-to safety measure for student safety when medical emergencies, online threats, and/or random acts of violence occur in our schools. There are two types of lockdowns. The first, is the full school lockdown. This occurs when the school’s principal or otherwise designated school official decides there is an active or imminent safety threat to all the students and teachers in the school. When this threat is broadcast to the school through a coded phrase, such as “Please return to your classroom immediately and await further announcements,” this requires the teachers and students remain or return to their last class, and remain quiet or out of sight by people walking down the hall. This is meant to protect against individuals who have entered the school with the intent to harm, and is meant to isolate that individual in a way that allows the individual to be easily identified and targeted by police entering the building. The second is a hold and secure, which is generally designed to lock out access to the school from the outside of the school, but students can be moved freely to allow emergency personnel to move through the school, generally in the case of a medical emergency. Due to the random nature of these acts, we will likely never be able to fully predict or protect against the random nature of these events. What we will be able to do, is put tools in the hands of those responsible for calling for lockdowns to increase the probability and speed of a swift response from the necessary authorities. 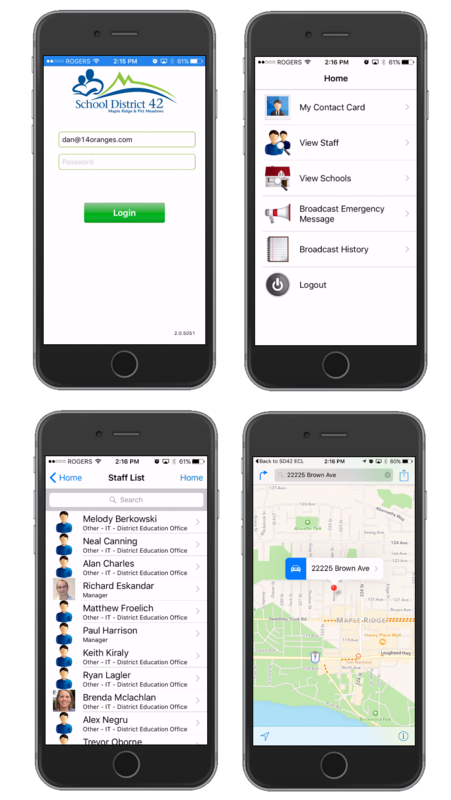 One of our customer’s, School District 42 in British Columbia, has developed an app with us that captures the calling tree information needed to contact the correct authorities when a lockdown needs to be called. Whether that is a school’s principal, the fire department, the police/ambulance, school board, or adjacent schools, the school district has collected all the up-to-date phone information into a single app along with the the ability to perform PIN protected broadcast push notifications to all users of the app in the event of an emergency. Calling trees allow principals to not only make the call for direct aid to notify authorities of a lockdown, but if they don’t get connected to that individual, they immediately see who is the next responsible official they need to call until they get the word out. These capabilities are available now, packaged as a turnkey service, for your school district. We can have your school district trained and operation in a matter of days. Please don’t hesitate to call us, we would be glad to get your school board setup for our emergency notification service.